Ivor is a keen supporter of Rolfing and, as well as working regularly with these two Rolfers, has referred many clients to Rolfing over the last several years. He is a firm believer that emotional trauma can get trapped in, and therefore affect the physical body, as much as physical trauma can affect our emotional well being. *This session formed part of a documentary entitled ‘Meetings with Ivor’ by Parszival Productions Ireland. Directed by Alan Gilsenan and Produced by Thomas Hardiman, the film had it's premier in January 2017 in Dublin Ireland and was officially opened by the President of Ireland Michael D Higgins. Ivor is now 90 years young and still works as a psychotherapist a few days a week. What is Rolfing®/ Structural Integration? Rolfing is a powerful system of hands on deep-tissue bodywork. It releases patterns that result from injury, repetitive strain, poor posture and emotional blockages. It brings the body back into its natural alignment with gravity, balancing the body to create ease, health and vitality. Rolfing is the mother of all deep tissue work, rooted in over five decades of experience and based on the principle that structure and function go hand in hand. If the garden hose has a kink, then the water simply won’t come out! Same with our bodies … just add in the emotional restrictions we get from pain, being out of joint and not feeling great! The Rolfing approach aligns and re-integrates your entire body by manipulating the fascia, which is the connective tissue that 'connects' every part of your body together. Fascia has a memory and organises around old hurts, which is why we all look so different and move with our own unique personality. Fascia holds the shape of your posture, balances your compensations, allows for freedom of movement and holds your organs, bones and muscles in place. And so releasing the restricted fascia can have profound healing effect on your physical and emotional sense of well-being. Traditionally, Rolfing consists of a series of 10 sessions. The series is designed in such a way that you don't just temporarily 'fix' a pain, rather we address the source of your pain and track it through the body, creating a supportive structure for the pain to stay away. Each session lasts roughly an hour and focuses on restructuring and balancing different parts of the body. The sessions follow a logical order, designed to free you from your old holding patterns. The further into the series you go, the deeper the work you receive, as the sessions have a cumulative effect with each one building on the last. Gillian has studied Rolfing extensively in Colorado, Hawaii, Brazil, Bali, Spain, Switzerland and the U.K and has been practicing since 2002. Her committment to further education to help each client in the particular way they need help is her trademark. Gillian is also a fully qualified Advanced Cranio-sacral Therapist with Upledger Ireland. Jim has studied Rolfing in Colorado, Brazil, Bali, Spain, Switzerland, Germany, Australia and the U.K. Jim's core belief is that it can be easy. Living in the body can be an easy pleasurable experience! He focuses a lot on ease of walking and movement. Jim is also a fully qualified Advanced Cranio-sacral Therapist with Upledger Ireland and works with Gillian on '4-handed' sessions on special request. A Rolfer with a passion for well bodies and healthy family relations. I am a mother of three. I specialise in easing pain in the body and providing the tools to keep the body fluid and upright. Caitriona studied with the Guild and the Rolf Institute in Colorado and Germany. Her passion for pre-natal comfort and post-natal care makes for fit and happy mothering. Tony is a Certified Advanced Rolfer, trained at the Rolf Institute in the USA and the European Rolfing Association in Germany. He has also studied extensively with the Barral Institute in Visceral Manipulation and Nerve Manipulation and integrates these therapies into his Rolfing work. Adopting a distinct approach to each client’s needs, Tony believes that Rolfing can change your life. Seamus has been practising as a Rolfer and Rolf Movement teacher for the past 30 years in Ireland. He regularly updates his knowledge and has studied and trained extensively throughout his career. Seamus is as enthusiastic about Rolfing now as he was when he first came in contact with this work. "If you can imagine how it feels to live in a fluid, light, balanced body, free of pain and stiffness, at ease with itself, then you will understand the purpose of Rolfing." Recently graduated from the European Rolfing Association in Munich, Joe has long been interested in bodywork and in how pain manifests in the body. Having suffered with back problems for some years before discovering Rolfing, Joe was attracted to how Rolfing can help relieve stress, pain and holding patterns and help us find better alignment, posture, movement and breath. This is the gospel of Rolfing: When the body gets working appropriately, the force of gravity can flow through. Then, spontaneously, the body heals itself. When the body gets working appropriately, the force of gravity can flow through. Then, spontaneously, the body heals itself. Mary studied Structural Integration and brought it to the South East. She opened The Posture Studio clinics throughout Wexford. Mary’s focus is on aligning the body to relieve pain, as well as re-educating people’s postural beliefs and habits, making sitting and movement easy and comfortable. Mary has both studied and worked in America and Europe. Also being a qualified teacher and fitness enthusiast, she continues to study and plans to teach posture and movement in schools, business’ and sports clubs. Rolfing gets its name from Dr. Ida Rolf PhD, who pioneered the practice in the 1940s. The logo of the Rolf Institute is based of a young client of Dr. Ida who came to her suffering from a rare bone disease and destined to life in a wheelchair. With her help he went on to lead a normal and very active life. Dr. Barry O’Brien B.Sc., Ph.D.
Barry O'Brien has been a Rolfer for 27 years, and an Advanced Rolfer for 13, and has studied extensively in Europe and America. As a keen sportsman and musician, he has used his experiences to improve people's movement, chronic pain, RSI issues, and posture problems. "It has been, and continues to be, my privilege to help people from all walks of life, and all ages." Susanne, originally a Speech & Language Therapist, certified in 1997 as a Rolfer and has undertaken numerous other trainings, e.g. body centered Psychotherapy, to further facilitate her client's needs. Susanne believes that embodiment leads to empowerment and her work aims to achieve a sense of well being on a physical, emotional and psychological level. 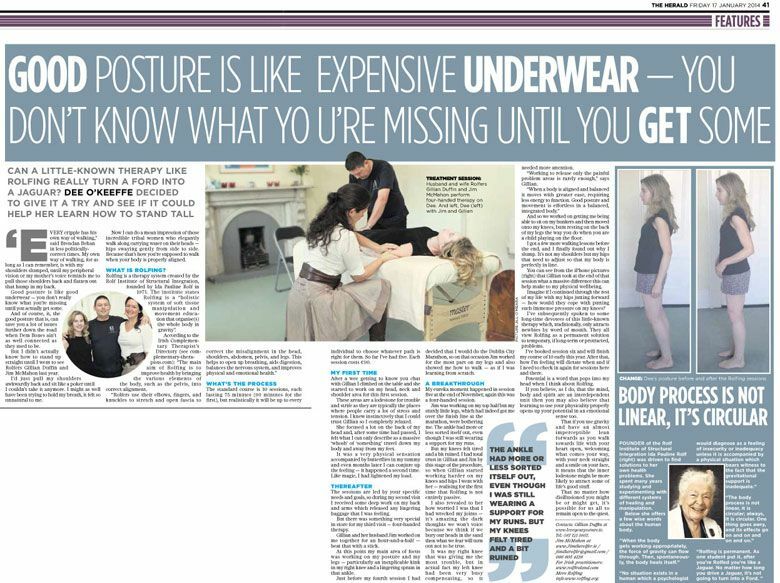 The Sunday Independent Lifestyle Magazine with a story about Rolfing. Website of the Rolf Institute of Structural Integration in Boulder, Colorado. The European Rolfing Association is a non-profit organisation based in Munich. The Guild for Structural Integration was founded and named by Dr. Ida P. Rolf in the mid-sixties. 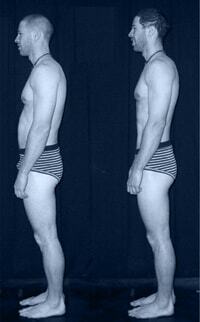 Great blog with a look at Rolfing and how it works.